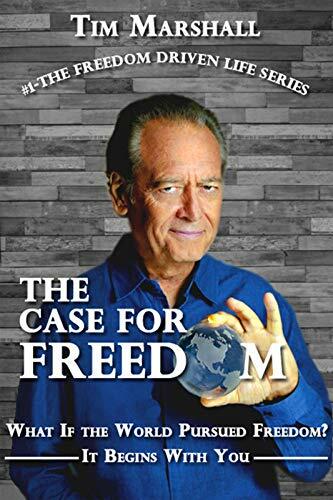 The Case for Freedom, the first book in the The Freedom Driven Life series, is an investigation into the reality of Freedom and how it has been either embraced or rejected (mostly rejected) throughout human history. Simply put, there is no Freedom to embrace if there are multiple diverse definitions, and especially if Freedom is whatever you want it to be. Why is “Freedom” capitalized? Because the concept is more important than most of us realize. The more I learn about Freedom and experience being Free, I gain a deeper understanding that Freedom is a nourishment, a life-sustaining force within me and for the world at large. Once you have tasted Freedom, can you be content with anything less? When true Freedom is the force that drives your life, it cannot be replaced. Once removed, life ceases to have real purpose. Due to the absolute reality and supreme majesty of Freedom, I believe that an understanding of what Freedom is and where it originates from should be the core responsibility of every individual throughout the world. How to live in Freedom should be the primary focus of all parents raising their children; Freedom should be the constant theme of all teachers instructing their students; Freedom should be every individual’s number-one personal goal. As you will see in The Case for Freedom, for individuals and whole nations worldwide the solution to overcoming mankind’s problems is the proactive embracing of Freedom. Get This Action & Adventure Book From Amazon. Tim Marshall has been an innovator, entrepreneur, teacher and successful business owner for over thirty years.